It doesn’t, but it does. Today marks three years since we lost Dad. I will never forget the moment I watched him breath his last, fighting, breath. I will never forget, that on the morning of one of his last good days, my birthday, that the first words to me that morning when he woke up was, “Happy birthday, son.”. I do not do it much, I probably should allow myself to more often, but I have cried a lot already today. I cried while I drove the kids to daycare today, I cried during my workout this morning, I am crying now. It still hurts. Bad. Everyday. I knew it probably would not, I has not, and it probably will not get better. However, I know it does. I have been preaching a series on the book of James the last few weeks. James chapter 1 is a healthy reminder often for me that trials are certain. The Lord promises us times of pain, wilderness experiences, loss, and difficulty. Losing Dad was not the first or the last trial that I, or my family has had to endure. James 1: 2 tells us we can, “Count it all joy”, when these times occur. I know other trials and storms are sure to come. I know the ones that the Lord has walked with me through have been for His glory and my good. I have to remind myself daily that my current circumstance does not change the character of God, nor the fact that Jesus secured my eternity on the cross. I know the pain of loss of the past and the potential for future loss may never seem to get better, but I know it will. It doesn’t, but it does. Its Valentine’s day; I know. I am not posting this to play off of this holiday (Or whatever you call it), this is something that I have been chewing on for a while and will challenge two separate groups of athletes with today during our weekly bible studies. That subject is “Reckless Love”. Here is what Im thinking. Willow is three going on thirteen. One of these days I am going to have some wimpy, pathetic, pimply faced (I kid) young man pursuing her without her fathers blessing. I also realize that Willow will probably give her heart to some young man who hasn’t earned it and doesn’t quite deserve it far too early in life. I was apart of this scenario more than I would like to admit in my adolescence. I pray that she will make wise relationship decisions, but am realistic to the fact that she may whiff a time or two. Imagine a scenario that plays out like this. Willow falls deeply for a young man. She pursues this young man despite the fact that he doesn’t reciprocate those feelings. The young man plays her, shows a little interest at times but never anything that can resemble any type of commitment to her. He flirts at commitment to her but also with other girls. He cheats on her. She loves and pursues him in spite of the fact that he may never love her back. This scenario is nightmarish for me. I would try to council her; tell her to move on. I would tell her that this was reckless, even scandalous of her. Who in their right mind would consider loving and pursuing a person like this? I am grateful that our God does. He loves us, pursues us, sacrificed, and never waivers. He does/has done all of this even despite the fact that there will be many that never respond with love or commitment to Him. Im thankful for a God who’s love is scandalous and reckless. If you want to check the text out that I will teach from look at the first few chapters of Hosea and the “scandalous” command that God gives to Hosea. I have just returned from serving with this great team this past week in Santa Cruz, Honduras. It was a great week. We were able to share the Gospel and treat over 1,000 Hondurans. We had over 100 decisions for Christ. The Lord moved in great ways. When we arrived to the mission house in El Plan on Saturday we were met with the news that our original mission location had been canceled and we had yet to have a replacement. I was able to get a FaceBook Live video out asking people to pray for us. This was a big deal. Its not easy to get a school director in any country to cancel a whole weeks worth of class so a bunch of foreigners can inhabit their school with absolutely no time to give their staff notice. We knew that God had us a place. The cancellation did not come as a surprise to our God. He would provide. Did He ever. We were thankful that one school director was willing to take a chance and allow us to come to his school on zero notice. I am also thankful that the dozen teachers and hundreds of students that showed up on Monday to teach and go to class were gracious and even excited about us being there for the week. This school was immaculate. It was a new school that Spain had built for this community. It was perfect set up in a perfect location. We were located less than 200 yards from the local church we were going to work with. My job for the week was to preach some of our church services that we had for each group that came to the clinic as well as do door to door evangelism. I challenged them and myself not to waste this week. We started the day with devotion. We shared our faith daily. We served. We fellowshipped with other disciples. We encouraged one another. We bore each others burdens. I challenged them, and myself, to let this become a lifestyle as we continue to live our lives “On Mission” for God back in our individual cities, in our individual jobs, and in our individual families. In Matthew 28 verse 19 Jesus tells us to “Go therefore and make disciples of all nations,”(ESV). The understanding here for the disciples would be for them to make disciples “As” they go, or wherever they be going be making disciples. I know this is day one stuff for some of you. I find myself at times struggling to implement this concept in my every day life. Living our lives “On Mission” should be a lifestyle, not just something we do a few weeks out of the year. The last challenge I gave the team was for them not to let the next time that they share Christ with someone be when they are back in Honduras next year. A Great God. A Worthless Ball. I think about my father everyday. I don’t thinks its possible for me not to. He loved me well. I will never forget him. I consider this significant in light of the fact that as flawed humans it can be difficult at times for us to think about anyone else but ourselves. It could have been very easy for me at times this last year to think the Lord had forgotten me. Hold on now. Before you start to judge me, a minister of the Gospel, for thinking God could ever forget me, consider David. David was, by God’s own standard, a man after the heart of God, and David admittedly struggled in the same way (Psalm 13:1). I am going to share something with you that I have never told anyone. I have been careful since dad passed this last April to be discreet in saying things socially that could stir up painful feeling in my family, especially my mother and sister, who loved my father very much and who’s struggle has been and continues to be difficult. I am aware they are probably going to read this. After dad had passed, as soon as the night before his funeral, I started having extremely vivid dreams which included normal, real-life scenes involving life with my father. Things like he and I mowing the yard at our old house on Allen Dr., and he and I working on restoring our current home. Nothing out of the ordinary. Each dream involved something almost supernatural, a hug/embrace with dad, that I could feel. At the end of each dream we embraced, I felt it, and it woke me up. I then would weep and thank the Lord for allowing me to feel what I had felt in that moment. This happened periodically over the next month. It helped me mourn in ways that I can’t explain. A couple months went by and I hadn’t had another dream. I would go by dads grave on a run or drive and hope that would spur one on, but nothing. One day I was driving home from work and asked the Lord for something. I needed anything, a dream, an experience, just something to know that He hadn’t forgotten about me. Then my mother called me. She said that she had something to give me the next time I was over. Becca, Willow, and I went over that evening. My mother handed me a ball. You see my father was notorious for writing our names on things that were ours. Ball gloves, basketballs, footballs, baseballs, notebooks, just about everything. He didn’t want us to forget that ” ” belonged to us, or anyone else to wonder. He wanted us to know that it was ours. My mother handed me an old, weathered, worn out baseball. The people that had bought our old house on Allen Dr. had been walking in the neighboring field and noticed something down in the grass. It was a baseball. It could have been anyones, but they knew it was mine. Because written on the old, glow-in-the-dark, baseball was “Jeremy W.” written in my fathers handwriting. Thankfully they didn’t dispose of this, seemingly, worthless, ball. They took it to my mothers house so she could give it to me. I had to walk out into the garage so my family wouldn’t see me break down. God had shown me in such an awesome way that He hadn’t forgotten me. I realize that I have done little over the last two years to be a good steward of this space/blog, however I have still carried with me the passion of sharing my life and my thoughts with you. So in order to get you back up to speed, I wanted to take a quick moment to catch you up. These next three paragraphs will give you a brief, but concise, picture into the life my families and my life over the last two years. Willow was born on September, 22 2014 at 5:33am on a Monday. This was a very unexpected occurrence, as Becca had not shown any signs that she would go into labor early. Outside of Jesus and Becca, Willow is the best thing that has ever happened to me. I believe Becca would agree. She is full of life and joy. She is a picture of God’s grace that I get the privilege of witnessing each day. We are so thankful for her. After spending the previous 6 years in student ministry, I had the opportunity to join a group of men in McGehee, AR in the planting of a church to reach outdoorsman in the Delta. What began as a dream from my time at Journey Church with Pastor Jeff Noble, to plant small groups and churches in the delta, became even more of a passion as I prayed through the possibilities of planting a church in SEARK with fellow church planter Scottie Johnson of Outdoor Church of Arkansas, as he shared with me his vision for planting churches to reach outdoorsmen and their families in Arkansas. DOC began as a small group of men meeting every other week in a farmers shop and today is a fully functioning church that meets weekly in our own facility here in McGehee, AR. DOC has been in operation just over one year. My dad has had a rare, non-aggressive, type of Leukemia over the last 9 years. We found out back in January that this cancer had mutated to a very aggressive type of T-Cell Lymphoma. Since finding out this diagnosis, my father has spent the better part of a month in the hospital battling everything from high fever and infection. He began treatment in the hospital and was released a few weeks later to come home, however he would have to be put back into the hospital due to complications of the cancer spreading to his central nervous system. Dad has a long and hard road ahead of him for recovery. We are praying for complete healing and for dad to be able to return home, return to work, and return to normalcy. We would appreciate your prayers in this as well. Well I hope this catches you up some. I will try to do better and post more often! The past few months have been an incredible blessing for Becca and me. We found out in February that we were expecting a baby! The Lord has brought us through an incredible season with allowing us to go through the pain of losing a child last year through miscarriage, to consistently redeeming our pain and hurt through blessing after blessing. At almost a year removed from our loss, we were greeted with the news of an ultimate gain in finding out we were expecting once again! A few weeks ago we found out that this September we will be expecting a baby girl. Willow Grace! With technology we can know more about babies, and so much other things than we have never known before. We learned from an app that we are using to track the growth of Willow that she is already having dreams due to the fact that babies develop their sleep-wake cycle in the womb. This is incredible! My mind quickly turned to stories that I am hearing of Muslims that are turning to Christ because of “Visions”, or dreams, in which they are seeing Jesus! For the 1,400 plus years of Islam’s existence they have resisted the Gospel but now are turning to it because they are dreaming about Jesus! So I have begun to pray that Willow will dream about Jesus. Yes, 27 week old Willow. People may think that is crazy, but I know that the God that is still creating and developing my sweet little girl, that is developing her brain, can put visions of His Son in there. I am praying that Jesus will start to enter her brain because I am already praying for the day that she will ask Him into her heart. I also pray that our hearts, visions, dreams, and lives will be filled with the Son. It isn’t quitting. It is a regrouping of sorts. It is a time to get away and be able to think, uninterrupted by media or other distractions. It is a retreat. And for the ministerial staff at FBCMonticello we are “Retreating” to a cabin off of the White River in Mountain View, AR. There will be golf, there will be biking, and there will be fishing; but most importantly there will be lots of prayer and meditating on scripture as we seek council from the Lord. Pray for us as we get away to unplug and talk goals and vision. We believe that this is important as we seek to lead and shepherd our church in a way that pleases the Lord. Thanks for reading, and thanks for praying. After a long nights sleep Becca got up and went for a run while I finished some preparation for my gear bags and bike. 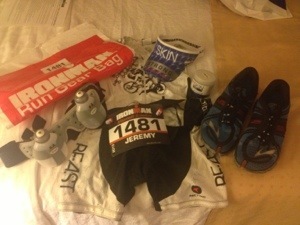 You receive these bags before you go into transition from the swim to the bike and then from the bike to the run. 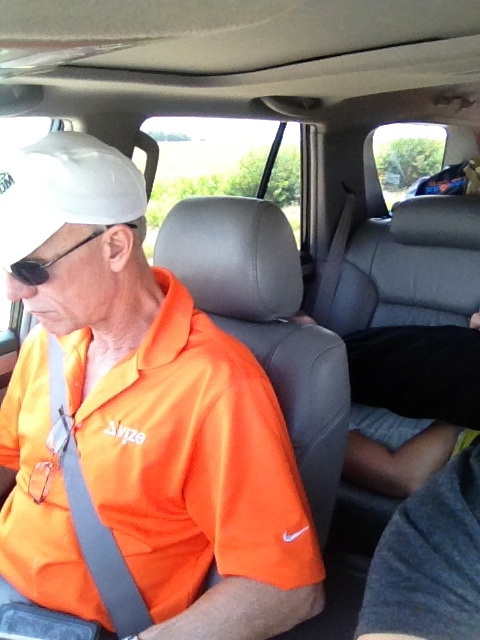 After her run we packed up the bike and gear bags and drove them to the Monona Terrace and the race site. After racking my bike and dropping off my bags, Becca and I made a few more small purchases at the Expo and went for a drive around the bike course. The course is a beautiful course that consists of two-main loops and a small out and back for a total of 112 miles. 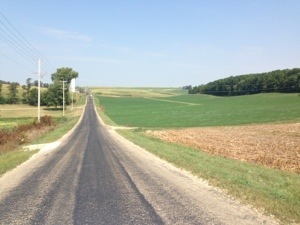 The scenery will hopefully relieve some of the pain from this hilly bike ride! After riding the course we went to my friend Jeff’s sisters house for a little swim party. We stayed and played with the kids and took a quick dip in the pool. 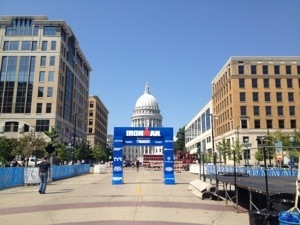 After a hour or so, Becca and I went and drove the mostly flat run course that takes you through downtown Madison. We then went and did some cargo-loading at Olive Garden and now are at the hotel watching some College Football! Go Hogs! Looking forward to the experience of this great race tomorrow! Going to be a fun day! Long, but fun! After a glorious and long sleep, Becca and I ate breakfast and headed back to the Expo and race area. We met up with good friends, Adam and Amanda, and spent most of the morning with them. Becca got in a run and Adam got checked in for the race. While we waited for Adam and Becca, Amanda and I watched the pro athlete panel. It was great to hear from pro’s like Maik Twelsiek and Hillary Biscay, along with others as they shared their thoughts and secrets on the race! Priceless info! After Adam and Becca returned we went to lunch. After lunch we did some more Expo browsing and visited the “Finish Line”. We wrapped up our time there by me getting in a pre-swim on the swim course. I am relieved to swim in a fresh water lake. 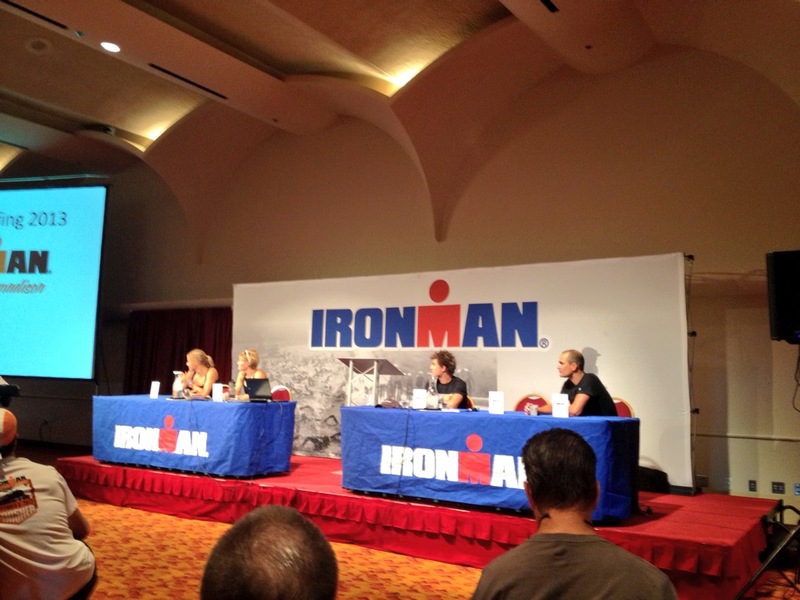 My first Ironman was in Florida and we swam in the Gulf of Mexico. It went very well but there is always a chance for major waves and tide currents! Becca and I came back to the room and I went for a short bike ride to make sure everything was dialed in on the bike while she took a nap! We ended the day with dinner at Panera and an early movie. After picking up a few more essentials at Target, we are now about to head off to bed! Nerves are starting to hit a little bit! So ready for Sunday to get here! I will give you guys a day three update tomorrow. 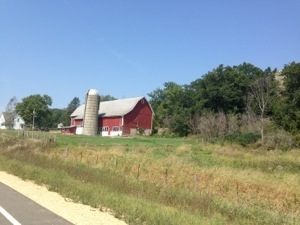 I have had a lot of texts and messages in the past day asking about my time thus far in Wisconsin so I have decided to do some mini-posts over the next few days. We made it to the expo for “Athlete Check-In” and received all of our gear bags and essentials for the race. We met up with good friends Jeff Glasbrenner and his family for a quick chat and then we headed out. After dropping David off at his his home stay, Becca and I made our way to the hotel to unload our things and grab some dinner. 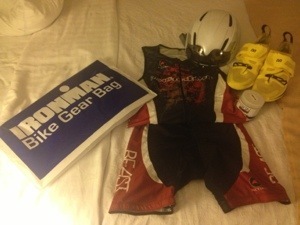 Day 2 will be a little more packed with Ironman prep and more Expo browsing. We did have two minor catastrophes on the trip. 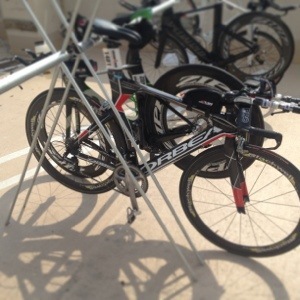 We were transporting another persons bike to the race for them along with David’s and mine. As we were looking for a place to park in Downtown Madison, we heard a loud “CRASH” noise and to our dismay saw her bike laying on the side of the street! It had fallen off my roof rack! Luckily we dodged a bullet and there were no major problems! We also had to change hotels due to smoke and it being in a rough area. With my asthma and the need for a solid, comfortable place to rest, we had to find other accommodations. We found a place that is much closer to the race start and much nicer as well! Blessed to be here. Will post a day 2 update soon! My guy C.J. sharing the Gospel today at FLOW!! This dude wakes up feeling dangerous. Consistently.